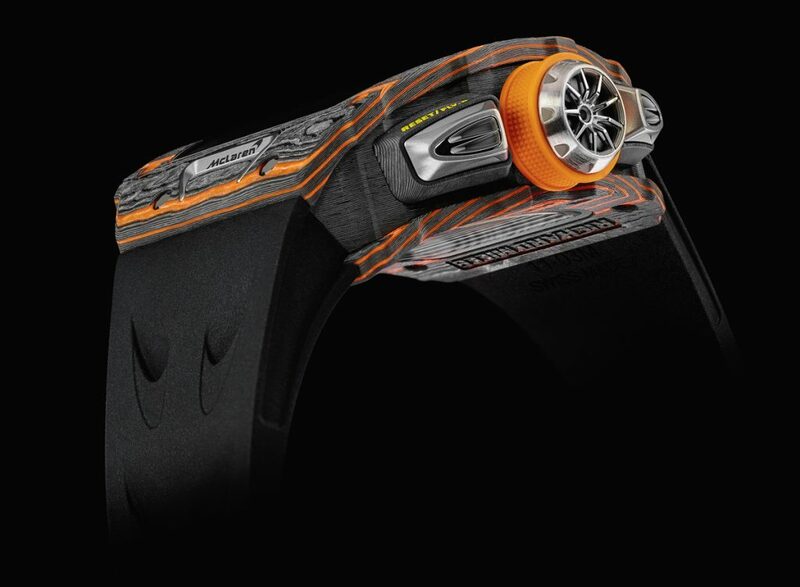 At the 88th Geneva International Motor Show this week, Richard Mille and McLaren Automotive unveiled their first co-created limited edition watch: the RM 11-03. This is the first Limited-Edition timepiece from the two brands, which share values of luxury, precision, excellence and cutting-edge technology. The new watch incorporates design features from McLaren cars, as well as lightweight technologies and high-function aspects typical of Richard Mille timepieces. Before we explain the CHF 180,000 Richard Mille, McLaren Automotive RM 11-03 watch, we want to warn you … it is made in a limited edition of 500 pieces and will be made available initially only to McLaren Ultimate Series customers. Th RM 11-03 McLaren Automatic Flyback Chronograph is the result of a year-long close collaboration between McLaren Design Director Rob Melville and Richard Mille Engineer Fabrice Namura. The design cues of the watch stem from the McLaren’s range of luxury sports cars, and a bit more specifically, the McLaren 720S. In fact, the titanium pushers are inspired by the McLaren 720S headlights. 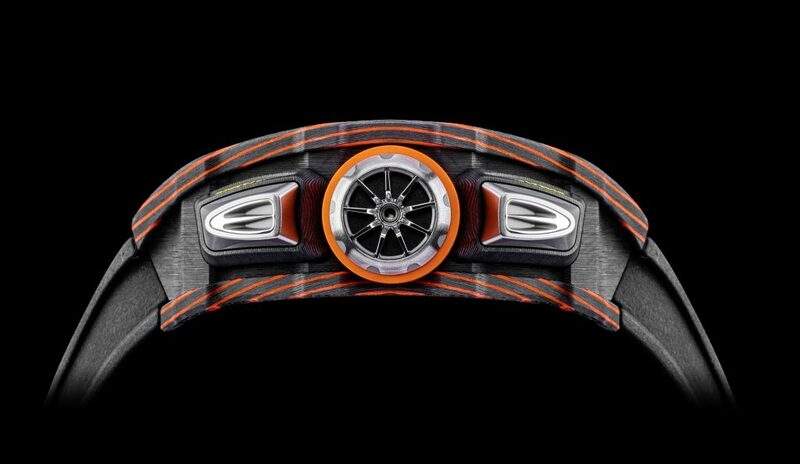 The bezel features titanium inserts that are shaped like McLaren F1’s air intake snorkels, and the titanium crown is shaped like a McLaren wheel. Additionally, the McLaren Speedmark logo is incorporated on the rubber strap specifically developed for this edition. The case of the RM 11-03 McLaren is made of the extremely lightweight and highly durable Carbon TPT® interlaced with Orange Quartz TPT®. Within it beat the automatic RMAC3 caliber, first launched in 2016, with a flyback chronograph with instant return of the counter to zero that makes it possible to quickly restart the stopwatch function. The movement is fitted with two barrels mounted in parallel for 55 hours of power reserve, and has a balance wheel with variable inertia. The concept of a variable-geometry rotor enables personalized winding adjusted to the wearer’s activity level. As mentioned, just 500 pieces will be made, and sold to McLaren Ultimate Series customers who can match their edition number the car to the caseback number of the watch. All watch sales will be exclusively through Richard Mille Boutiques. RMAC3 CALIBRE: skeletonised, automatic winding movement with variable-geometry rotor offering hours, minutes, seconds, flyback chronograph, 60-minute countdown timer at 9 o’clock, 12-hour totalizer, oversize date and month indicator. Dimensions : 49.94 x 44.50 x 16.23 mm. Power Reserve: Circa 55 hours (±10%). Actual power reserve results will depend on how much the chronograph features are utilised. Richard Mille RM 11-03 McLaren Flyback Chronograph watch houses the RMAC3 caliber. 6% aluminium and 4% vanadium. 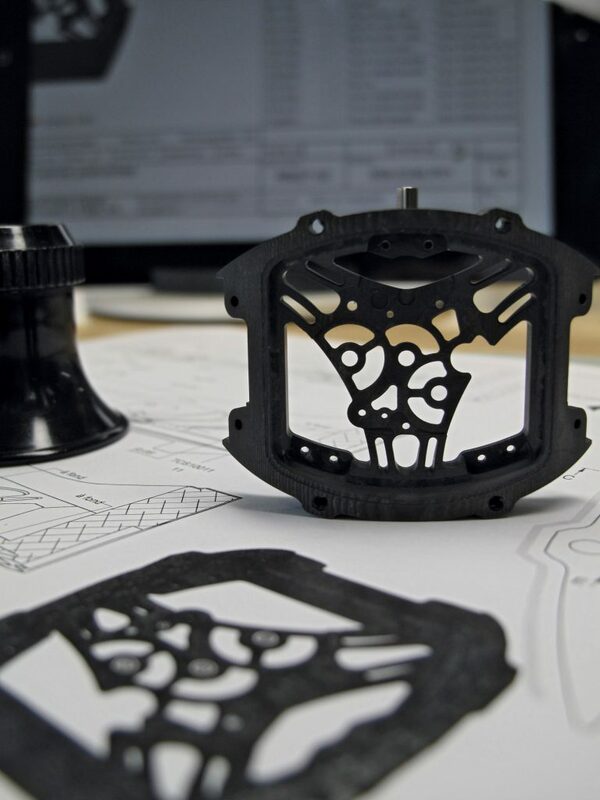 This combination further increases the material’s mechanical properties, which explains its frequent use in the aerospace, aeronautical and automobile industries. The baseplate of the RMAC3 calibre has been optimised to achieve an extremely low weight/resistance ratio. Using the pusher located between 4 and 5 o’clock, the running chronograph can be reset without first having to stop the mechanism. This was originally developed for pilots to avoid wasting time (and therefore accuracy) as a result of stopping, resetting and starting the chronograph whilst crossing a navigational point. When the chronograph function is activated, the hours and minutes show the time elapsed thanks to the counters at 6 and 9 o’clock, while the central hand indicates the seconds. The user can start or stop the chronograph function via the pusher located between 1 and 2 o’clock. The flyback function can be continuously reset by depressing the pusher located between 4 and 5 o’clock. OVERSIZE DATE DISPLAY: Semi-instantaneous, placed in a horizontal aperture under 12 o’clock with automatic adjustment for months of 30 or 31 days. MONTH DISPLAY: Semi-instantaneous, indicated by Arabic numerals placed between 4 and 5 o’clock. FREE SPRUNG BALANCE WITH VARIABLE INERTIA: This type of balance wheel represents the ultimate in innovation. It guarantees greater reliability when subjected to shocks and also during movement assembly and disassembly, hence better chronometric results over time. The regulator index is eliminated and a more accurate and repeatable calibration is possible thanks to 4 small adjustable weights located directly on the balance. 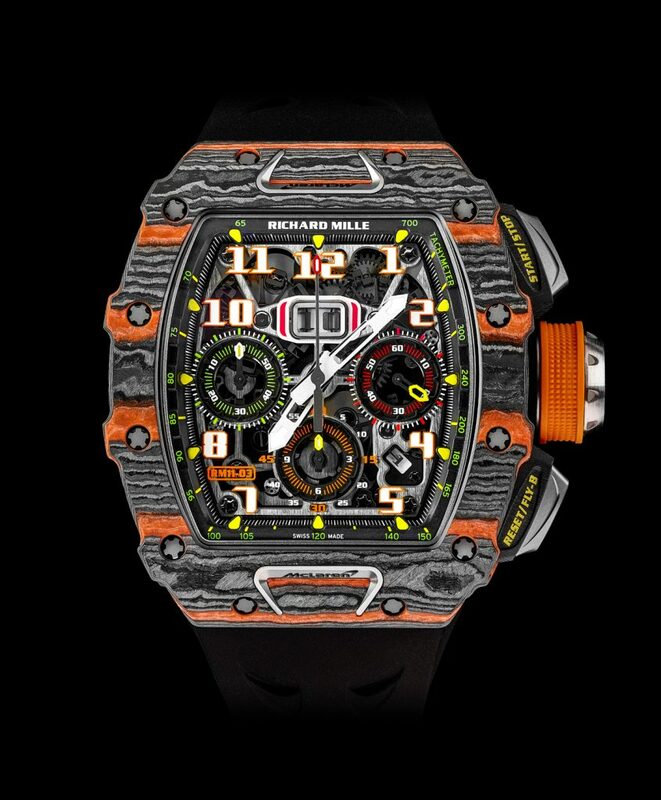 Richard Mille RM 11-03 McLaren Flyback Chronograph case side. 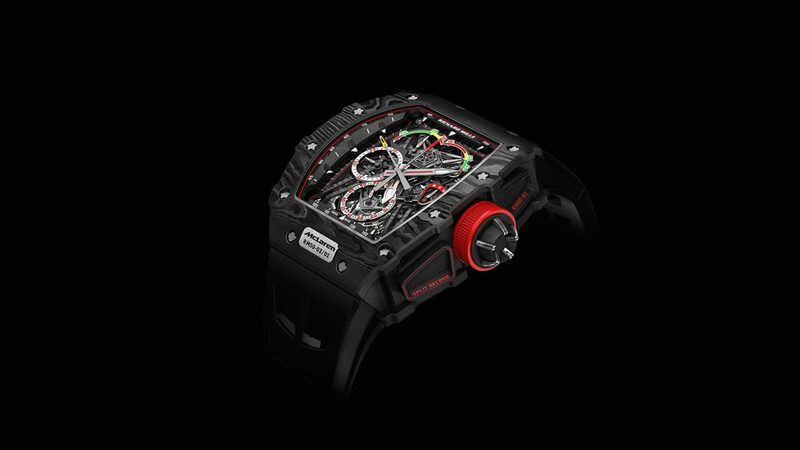 This exclusive Richard Mille design makes it possible to effectively adapt rewinding of the mainspring to the user’s activity level, whether in sporting or non-sporting environments. By adjusting the placement of the wing, the rotor’s inertia is modified to either speed up the winding process in the case of leisurely arm movements, or to slow it down during sporting activities. As a result, this invention allows the movement’s winding mechanism to be optimised and personalised to the owner’s lifestyle. 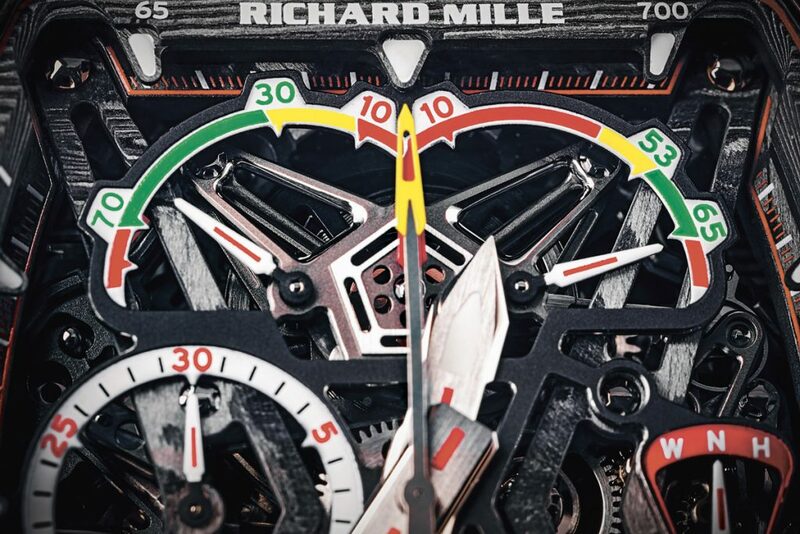 A close-up look at the dial of the Richard Mille RM 11-03 McLaren Flyback Chronograph. Photo: @Didier Gourdon. DOUBLE BARREL SYSTEM: The double barrel system contributes to torque stability over a longer period. This is achieved by using higher rotations of the barrel, thereby reducing pressure and wear on the teeth, bearings and pivots, improving long-term performance. SPLINE SCREWS IN GRADE 5 TITANIUM FOR THE MOVEMENT: This permits better control of the torque applied to the screws during assembly. These screws are unaffected by physical manipulation during assembly or disassembly and age well. 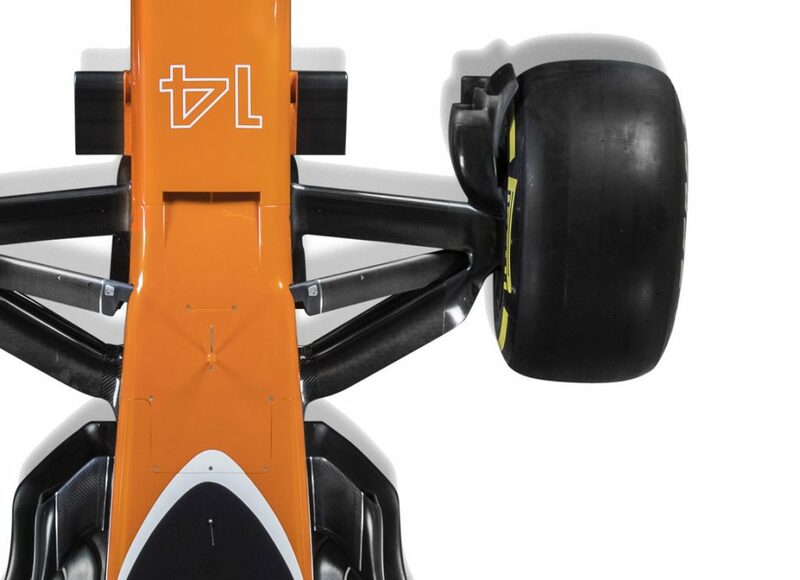 The case of the RM 11-03 McLaren is made from Carbon TPT® and Quartz TPT®. Carbon TPT® and orange Quartz TPT® are exclusive material with a unique appearance. Their remarkable surface displays extremely regular undulations, as they are composed of multiple layers of parallel filaments obtained by dividing carbon fiber or silica threads. These layers, with a maximum thickness of 45 microns, are impregnated with resin then woven on a special machine that modifies the direction of the weft by 45° between layers (Quartz TPT® layers are saturated in a orange resin developed specially for Richard Mille). Heated to 120°C at a pressure of 6 bars, these materials are then ready to be processed on a CNC machine in Richard Mille’s case factory. The case of the RM 11-03 is water resistant to 50 meters, ensured by two Nitrile O-ring seals. These screws are unaffected by physical manipulation during assembly or disassembly and age well. In carbon fibre filled with an approved luminescent material. Sapphire (thickness: 0.40 mm) with anti-glare treatment (2-sided), protected by 8 silicon braces fitted into grooves on the upper and lower flanges. It should be noted that RIchard Mille has been the exclusive watch partner of McLaren Formula 1 racing team for two season thus far (with team drivers wearing Richard Mille watches) and last year released the RM 50-03 Tourbillion Split Seconds Chronograph Ultralight McLaren F1 watch. 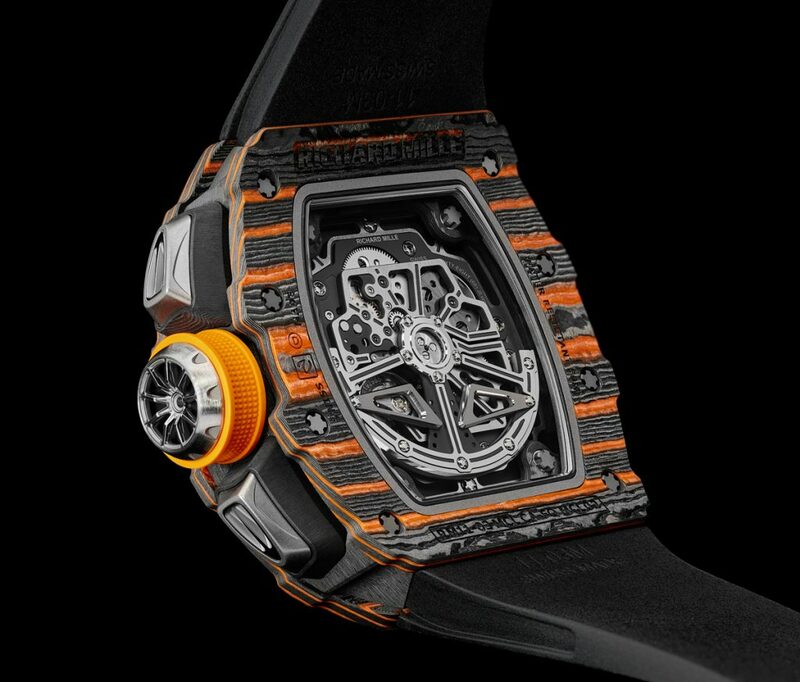 That timepiece, a limited edition of just 75, is priced at $1 million and is sold only at Richard Mille boutiques. The 50-mm tonneau-shaped watch is the lightest split-seconds chrono in the world: less than 40 grams including the strap. The case is made of Graph TPT and Carbon TPT. RM 50-03 Tourbillion Split Seconds Chronograph Ultralight McLaren F1, which is aligned with the McLaren Formula 1 racing team. McLaren Automotive is a creator of luxury, high-performance sportscars and supercars. The company, launched in 2010, is now the largest part of the McLaren Group. Every vehicle is hand-assembled at the McLaren Production Centre (MPC) in Woking, Surrey, England. The company has three defined product families: Sports Series, Super Series and Ultimate Series, which are retailed through over 80 retailers in 30 markets around the world. McLaren is a pioneer that continuously pushes the boundaries.